The National Institute on Aging says that six out of 10 falls for senior citizens happen at home, often in areas where there are stairs or while getting in and out of the bathtub. A little prevention can keep a costly, painful, or even life-threatening accident from occurring, so it’s worth taking the time to add a grab bar or rail to your bathtub. We’ve rounded up our favorite bars and rails on the market right now for extra grip in and around your tub. We like this tub and shower bar for those who don’t need to rest all their weight and want easy installation. The Changing Lifestyles Safe-er-Grip is a 17-inch bar with strong suction on both ends. We found these incredibly straightforward to install. You just flip the tabs on both ends and press down. To remove them, flip the tabs again to release the suction. For under $20 this is an ideal bar if you have super smooth tiles larger than 4 x 4 inches. We recommend this for individuals who do not need to put their entire body weight on a rail or bar while getting in and out of the shower or tub. If you need to rest a significant amount of pressure on something while stepping out, a clamp or bar with screws would be a better fit. However, if you just need some balance help or a little assistance stepping out, this is a good choice. The ease of installation, affordable price, and lack of damage from drilling holes are substantial benefits for a bit of added safety. 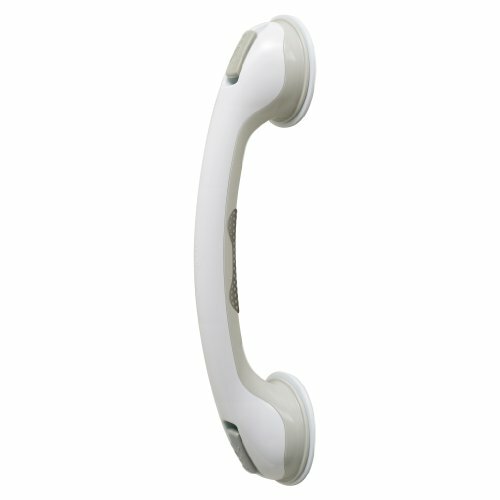 Sturdy, secure, and ADA compliant, this is our favorite for those who only need a bath (not shower) grab bar. The Moen DN7010 Home Care Tub Safety Bar is an excellent, durable bar if you’re looking for a grab-bar for getting out of a tub in particular (as opposed to showering). This seven-inch high grip is sturdy, fits securely, and resists corrosion in a humid environment. We like that you can adjust each side individually for a perfect fit if the rear of your tub is slightly wider or more narrow than the front. 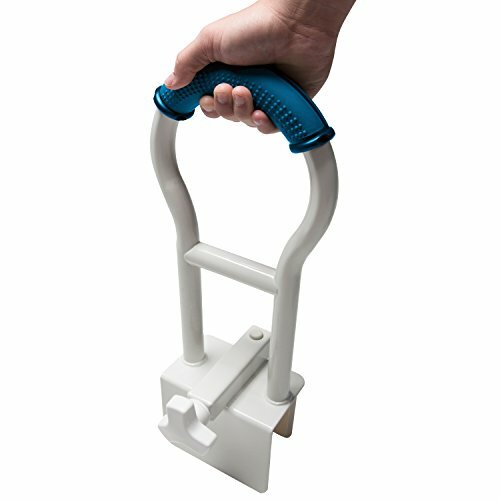 This grab-bar also meets the strict ADA guidelines for safety and security for those with disabilities. This is a safe, reliable bar as long as it’s installed correctly. The clamps are simple to install, and the unit is surprisingly lightweight at just under two and a half pounds. For those only in need of a grab-bar for the tub, this is our favorite! The angle of this model offers various height points to grip. 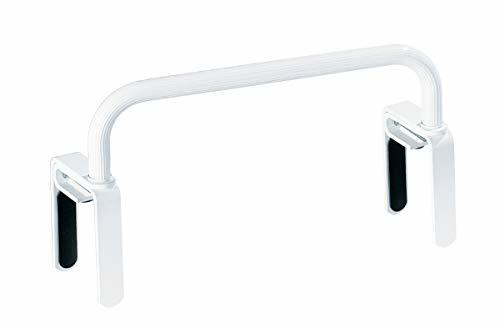 If you want a grab-bar of varying heights, the AURALUM Bathroom Grab Bar Bathtub Arm Safe-Grip Bar is an attractive, highly polished, lightweight option. It’s made of lightweight aluminum and recommended for people who don’t need to put excessive weight on the bar but just need a little assistance. The bar is mounted by drilling the screws into the tub wall, but if it’s appropriately installed it’s a sturdier option than some other styles. Covers will conceal the screw holes and the bar can be placed at any height you choose. We love that this can be used in other areas, as well, such as laundry rooms or stairwells. It works well anywhere there might be a slippery floor or a few steps to climb. Resting your full weight on the bar is not recommended. The excellent price and compact size make this our favorite for those on a budget or for a travel option. 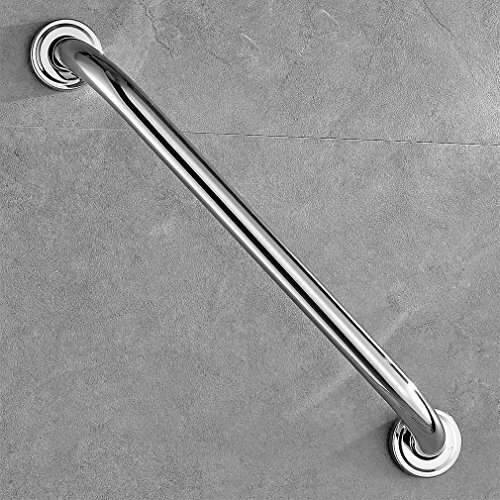 The AmeriLuck Bath and Shower Suction Grab/Grip Bar is an incredible value at under $15. If you need an affordable bath or shower bar but don’t have a lot to spend, this one is easy on anyone’s budget. The installation is easy. Tabs flip into place the grab bar suctions to your tub. What we particularly love about this bar is the green indicator for safety. When the bar is not securely attached, the color window will be red. When the grip securely adheres to the wall or tiles, the color window will flip to green. The suction cups require a non-porous surface such as tile (must be 4 inches or larger). Do not install over seams or grout. This is an excellent option particularly for smaller stall-style showers or tubs, as the bar is a bit more compact than some competitors. Overall, a great buy. We love the absolute sturdiness of this fantastically-rated tub rail. 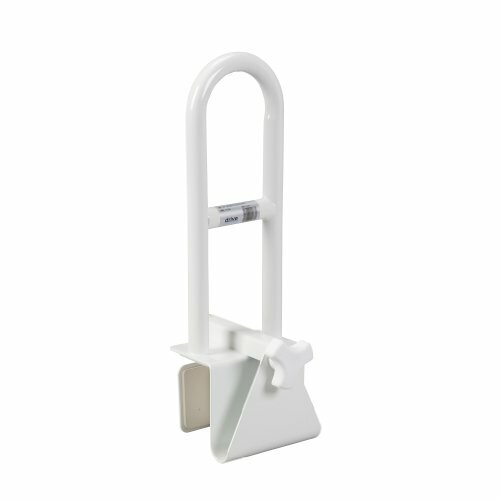 The Drive Medical Steel Clamp on Tub Rail has one of the highest users ratings we’ve seen out of any bathtub bar. With its sturdy steel construction, powder-coated humidity resistance, and reasonable price we understand why. The adjustable clamp fits most tubs, including many of those with curved sides. We love that this safe, reliable tub rail provides this much security without any tools. There is no need to drill into tiles or tub fiberglass or worry about suction cups coming loose. 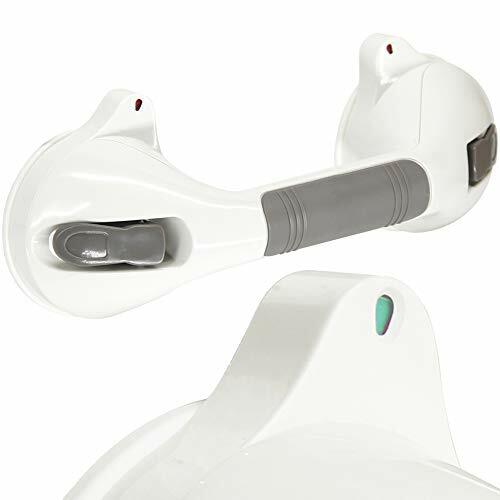 The adjustable clamp has rubber pads on the inside to prevent it from scratching your tub. The edges of the metal are smooth and pose no risk of scratching you if you happen to bump into them. If you’re looking for a tub-only rail or grip bar, this is definitely one of our favorites for reliability. The extra non-slip grip on this bathtub rail is ideal for slippery, humid conditions. The Pcp Bathtub Safety Rail with Sure-Grip is ideal especially if you’re undergoing recovery for a procedure or injury. This sturdy steel rail is suitable for those up to 300 pounds. That makes this rail a good choice for those who need more weight capacity than suction-cup shower bars offer. We particularly like the added safety grip at the top to prevent your hand from slipping if the rail gets wet. The texture and slightly raised edges of the grip also help keep you stabile. This rail requires no tools for installation. Once the rail is in place, there’s a locking mechanism that will keep it from moving around. When shopping for a bathtub grab bar, you first need to consider your weight. Before quickly deciding on a bathtub grab bar, consider some of the following to pick the right one for you. With safety around the tub being a serious concern, you want to be sure you’re choosing the right bar or rail for your bodyweight and tub style. When shopping for a bathtub grab bar, you first need to consider your weight. If you need it to support your full body weight, it’s better to the veer toward a drill and screw installed model. Suction bars are not meant for heavy loads of weight and can come loose over time. If a wall mount isn’t what you’re looking for, a sturdy clamp style tub rail that attaches to the side of the tub can be a good option that supports body weight well. Double check the measurements of your bathtub and evaluate whether you want a bar or rail. Consider if it will be installed near a curved area of a tub or if the model you’re considering is safe for fiberglass tubs. Some clamp-on rails are not recommended for specific tub widths and styles, fiberglass, or shapes with more noticeable curves in the side of the tub. The material of the grab bar becomes significantwhen you factor in how wet it will get and the weight load it needs to bear. An extremely lightweight aluminum model might work well for very wet conditions but may not offer the support you need. If the bar or rail is likely only to encounter a lot of humidity or occasional water, a durable coated steel or a stainless steel model is an excellent option. Slipping is not the only danger when it comes to the bathtub. The health ministry in Japan launched an investigation in 2012 after it was projected that around 14,000 people passed away annually in the tub. That number is three times as many people as those who are killed in car accidents. They found that the deaths were linked to drowning, heart attacks, slips, and head injuries. The deaths increased during the winter months when older people moved from the warmer areas of their homes to the bathroom. This can cause thermal shock. Don’t get into a steaming tub if you’re excessively cold. Slowly warm up the temperature to adjust your blood pressure without shocking your system. Having a grab bar that can help you get out quicker and safer is highly recommended. You may also want to consider adding non-slip strips or a mat to the floor of your tub as an extra safety precaution. Always factor your personal preferences, budget, and needs before picking your bathtub bar. It’s such a personal choice for each individual. It’s important that you feel secure in your home and are able to go about your daily activities as you age in place. A bathtub grab bar is a small, relatively inexpensive way to create safer spaces.